FOR A SPECIAL OCCASION’ STEAK & BLUE PIZZA — NORTHERN DOUGH CO. 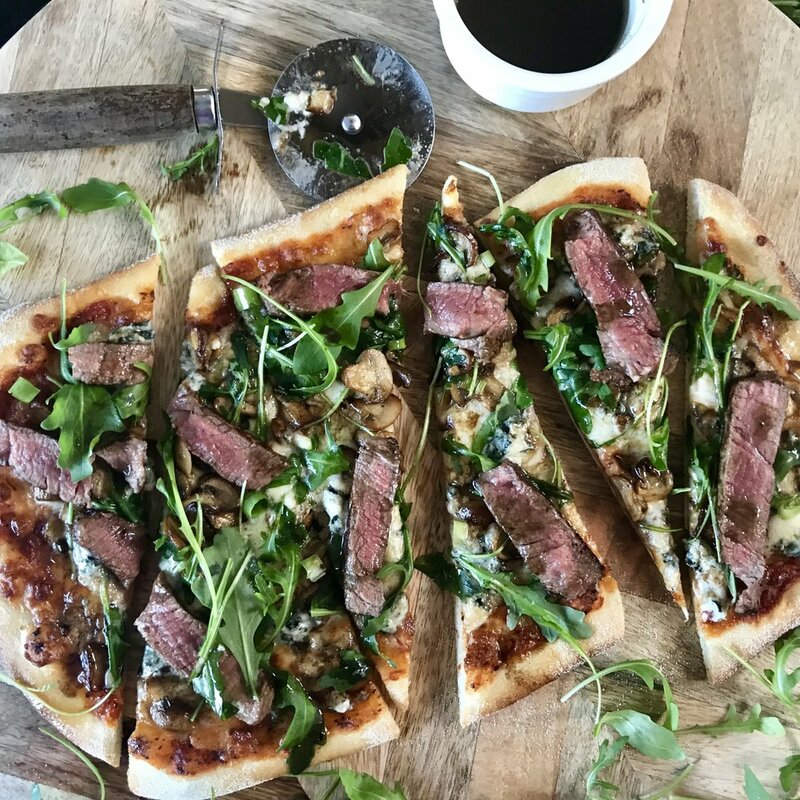 Staying in is officially the new going out, and this delicious pizza, packed with flavour and topped with fillet steak will rival any restaurant menu. Eat it dressed up at your dining table, or in your pjs in front of the tele, you’re at home, anything goes! Pre-heat your oven to its hottest setting, and lightly flour your worksurface, rolling pin (if using) and baking tray. Roll or stretch your dough to approx. 10-12 inches in diameter (this will give you a classic Neapolitan style thin and crispy pizza. For added flavour, chop and sauté your mushrooms in the butter and leave to one side for a minute, or you can simply slice them. Move your pizza base to the lightly floured baking tray, spread evenly with passata, then sprinkle with mozzarella and add the mushrooms, blue cheese and onions. Move to the hot oven for approx. 8-10 mins. Meanwhile, pan fry your fillet steak in a hot dry pan to your liking. If you enjoy it medium rare, a few minutes on each side will be ideal. Allow to rest while you take your pizza out of the oven (which will be cooked when the crust has turned golden brown and the toppings are bubbling). Slice the steak into thin pieces and add to the top of the pizza, along with the rocket, then drizzle with balsamic dressing and enjoy!